Optical illusions are simple, yet mind-boggling at the same time. An optical illusion is defined as something that is perceived differently than objective reality. Basically, optical illusions trick you to see something that is not there, hide things that are there or make you look again and say "Wait, what?" Optical illusions make your eye perceive the image differently than it actually is. 1. Literal optical illusions - They make the images that are different from the objects that make them. 2. Physiological illusions - They stimulate the brain by playing with light, brightness, color, or movement. 3. Cognitive illusions - The brain and eye are tricked to make unconscious assumptions. Square A and Square B are actually the same color. Do these lines seem parallel? Look again, because they are! The never-ending staircase: Where does it begin and end? In the hit movie, Inception, characters use this staircase to trick the mind. M.C. Escher is a huge fan of creating impossibilities with art. What do you see? Can you make sense of this? Is the color of the intersection between lines a different color from the lines themselves? 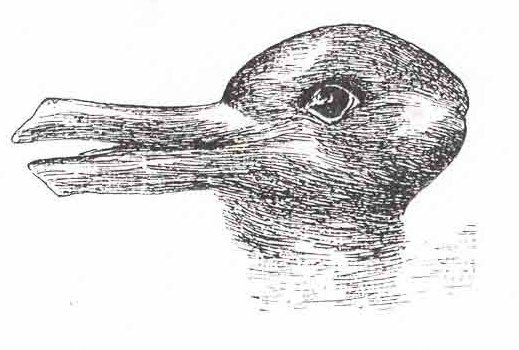 Do you see a duck or a rabbit? Or both? What attracts people to stare at optical illusions for hours on end is the possibility of impossibility, or even the possibility of many possibilities. Optical illusions make us question what is real, what is fake, and what we have ignored. It's amazing that your brain can trick your eyes and in turn, your eyes can trick your brain at the same time. For more information about optical illusions, check out Experts123.com.